10cc is a singularly talented group who use mid-Sixties Anglo rock as a stepping stone to their own bizarrely imaginative style, yet manage to stay within the supposedly limited confines of short, AM-oriented rock -- small wonder since each of the four, though not name performers, were part of the British Invasion ten years ago. 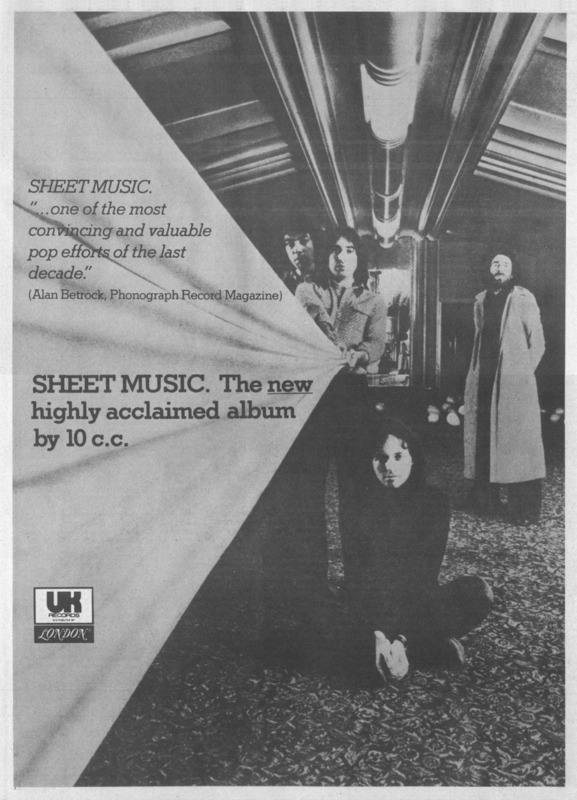 Sheet Music, a worthy successor to their debut 10cc, includes a McCartneyesque poke at Wall Street, a reggae barn-burner, frequent Beach Boys harmony, and crisp fuzz-toned guitar throughout. All are infused with outrageously humorous lyrics which lament burned-out flash guitarists, carry on a dialogue between a jet plane and a time bomb aboard it, and invent a new dance called "The Sacro-Iliac" -- not your everyday Top 40 fare. But all ten cuts here would sound fine on any DJs playlist, because 10cc has concocted standard pop into their own inventive, even sophisticated, art -- an art that you can tap your feet to, and turn up the car radio about. - Charley Walters, Rolling Stone, 9/12/74. Another fine, though often unusual set from one of Britain's premier rock bands. There is a certain zany feeling to this group made up of ex-Mindbender Eric Stewart, top writer Graham Gouldman, Kevin Godley and Lol Creme, yet most of their songs are far from silly when carefully listened to. Tackling everything from Wall Street to prima donna bands to Hollywood, the band is characterized by some of the most innovative vocal techniques and instrumental arrangements around. Mixing guitars, synthesizers and vocals as if they were one, this could be the set that will make the band as major a group here as they are in Britain. Best cuts: "The Wall Street Shuffle," "The Worst Band In The World," "Somewhere In Hollywood," "The Sacro-Iliac." Following 10cc's self-titled debut album, Sheet Music took a big step toward the sound that would become the group's trademark. The record typifies the eclecticism and breathless invention that characterized 10cc's earlier work -- soft and fuzzed art-rock guitars, seamless harmonies, elements of spoof and parody, and shifts between musical genres (often within the same song). Part of the album's strength lies in the fact that all four musicians (Lol Creme, Kevin Godley, Graham Gouldman, and Eric Stewart) were also songwriters and multi-instrumentalists. (Indeed, Gouldman wrote a string of major hits in the Sixties, including The Yardbirds' "For Your Love" and The Hollies' "Bus Stop.") With lyrics that are never less than sharp, and are frequently sarcastic ("The Worst Band In The World," a satire on musical mediocrity, may be the most ironic song ever), and a host of melodic twists and turns, 10cc created a piece of well-crafted, highly idiosyncratic pop. The album evinces a passion for polished production, the narratives are bizarrely humorous -- "Clockwork Creep" imagines a dialogue between a jumbo jet and a bomb, elsewhere there are references to voodoo -- and the band seems just as comfortable with rockers such as "Silly Love" and hit single "The Wall Street Shuffle" (a UK No. 10) as with their bizarre creations of artsy pop and even reggae. On "The Sacro-Iliac," Eric Stewart and Graham Gouldman ceate a new dance for nondancers, while "Old Wild Men" sees the introduction of Godley and Creme's "Gizmo," which could be placed on the bridge of a guitar to simulate a range of instruments. - George Durbalau, 1001 Albums You Must Hear Before You Die, 2005.